Preheat oven to 180°C (350°F). Place the fennel and cumin seeds in a mortar and pound with a pestle until fine. Add the garlic, oregano, sugar, salt, vinegar and 2 tablespoons of the oil and mix to combine. 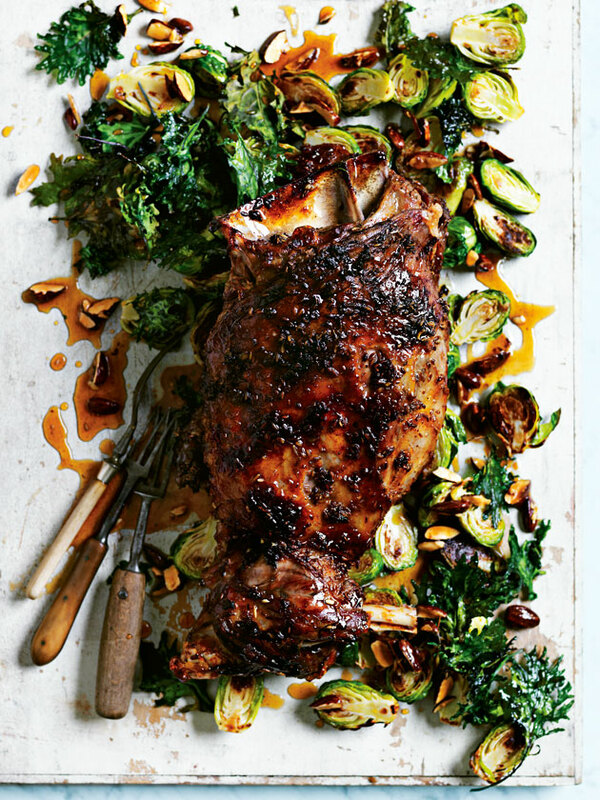 Rub the lamb with the spice mixture and place in a large roasting pan. Add the water and cover with aluminium foil. Roast for 2 hours, remove the foil and spoon over the cooking liquid. Roast for a further 40 minutes or until golden brown. Place the brussels sprouts, salt, pepper and the remaining oil in a large bowl and toss to combine. Transfer to a large lightly greased oven tray lined with non-stick baking paper and roast for 15–20 minutes or until golden. Add the almonds and kale and roast for a further 5 minutes or until the kale is crisp. Serve the lamb with the greens. Serves 4–6.